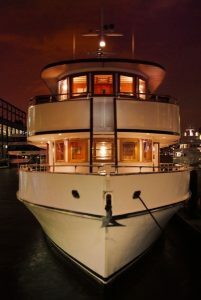 Situated on New York Harbor in Jersey City, New Jersey, directly across the Hudson River from downtown Manhattan, the Newport Yacht Club & Marina is conveniently located at 6th Street, Jersey City, NJ 07310. New York’s favorite luxury Motor yacht Eastern Star is relocating to Long Island! Now departing Huntington, Glen Cove, Port Washington, Port Jefferson, Greenwich, Stamford and Norwalk CT!